Most people assume that having flat feet is always a no-go area for joining the military. The truth is, it’s actually quite a grey area. They could reject you, but it’s also possible that flat feet won’t make any difference at all. Confused? I’ve done a ton of research into this, and I’m going to share it with you today. Read on to find out exactly how flat feet might affect your chances of joining the army. Also known as pes planus, flat feet occur when the arches of the feet collapse. This leaves the entire soles of the feet almost or completely touching the floor. Flat feet can be something you’re born with, and this is known as congenital pes planus. It can also develop at some point in your life, which is known as acquired pes planus. Are Flat Feet an Entry Barrier to the Military? Here’s the thing: you can join the army, even with flat feet. But it can also be true that flat feet rule you out. What often happens is that you can get an “at first disqualification” on the grounds of flat feet. You can get a waiver, but it’s not always approved. 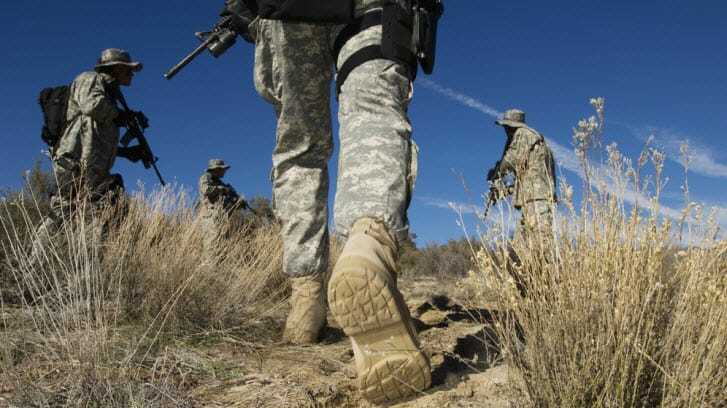 There are two situations in which flat feet can fail the US military’s physical requirements. One of the main issues is whether your flat feet cause chronic pain. If they don’t, you’re not that likely to be rejected. But if the pain is a frequent problem, you could be unfit for service. With “symptomatic” flat feet, you are more likely to have this chronic pain. This can be a problem for joining the military and will usually disqualify you. The need for corrective footwear is another factor. Having “asymptomatic” flat feet means you need corrective footwear to reduce pain. If you wear these, this type of flat foot doesn’t tend to cause pain. This is also known as a flexible flat foot. If you only wear basic inserts in day-to-day life, you may still be able to join the army. This is generally considered a mild degree of being flat footed. Orthopedic and prescription supports are more of an issue. Flat feet that need this level of support are often seen as high risk for other foot and leg problems. I’ll talk more about this in the next section. What if you have no ongoing pain and don’t use orthotics? There’s a good chance you’ll sail through at the Military Entrance Processing Station! In other words, needing special orthotics means you won’t be fit for service. Ditto for symptomatic flat feet that cause pain, either congenital or acquired. Why Are Flat Feet a Problem in the Military? So, why are flat feet such a problem for joining the military? Let’s look at their connection to different foot and lower leg problems. A study of 287 Israeli Defense Force trainees found that high arches are more likely to cause stress fractures than flat feet. Trainees with the highest foot arches got nearly 4 times as many stress fractures than flat feet. Another study of US Naval Special Warfare Training Center trainees also found that foot arch isn’t linked to stress fractures. On the other hand …. A study of 83 female infantry recruits suggests that a low arch could be a risk factor for sprained ankles. As you can see, there is some evidence that having a low arch can put you at bigger risk of issues with the lower legs. There is also the challenge of arranging special footwear in a military situation. This can make people with flat feet an inconvenience in the eyes of military recruiters. In particular, flat feet can cause problems for training and performing military roles. Marching, standing for a while and running can all be difficult with very flat feet. Even keeping your balance can sometimes be a challenge. These issues can make military operations a big challenge. I hope you have enjoyed finding the answer to the question: can you join the army with flat feet? As you can see, it’s a case of how severe it is. 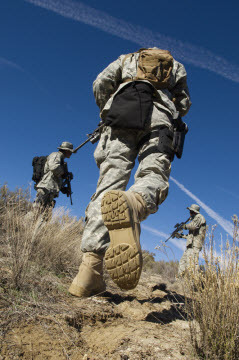 A mild flat foot will often not affect your chances of joining the military. It can be a different story with a more severe flat foot, especially if you have chronic pain and wear orthotics. The latter scenario can mean you are not eligible to join the military due to the problems we’ve discussed. If you have any questions I haven’t covered here, let me know, and I’ll answer as soon as I can.